Chile poblano is a large, dark green chile sometimes almost black-green in color and very pleasant in flavor. It grows in many parts of Mexico. It is exported to the US were it is often found under the name Pasilla. They are first grilled, skinned and then stuffed (being called chile Rellenos) or cut into strips and served in salads. For Independence day in Mexico chile poblanos are commonly served in a traditional dish called “Chiles en Nogada”. This dish has the colors of the mexican flag: green, white and red, (green chile, white walnut-based cream sauce and red pomegranate sauce). 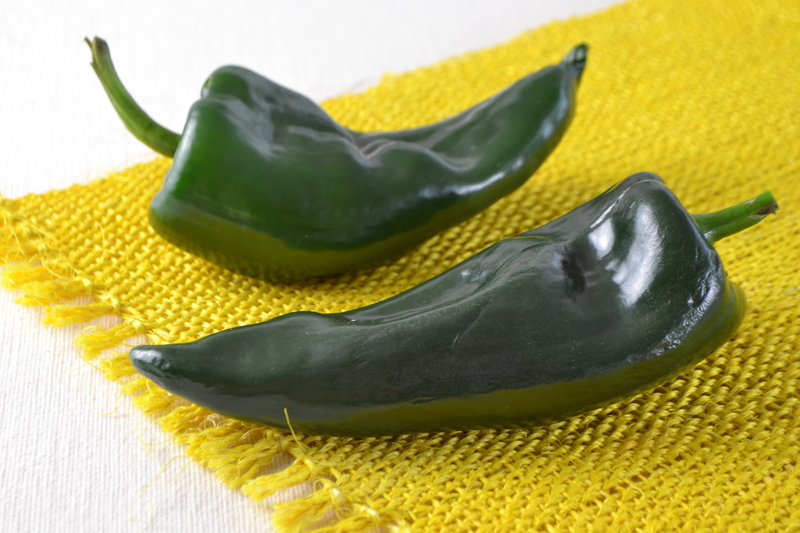 A dry poblano chile is called chile Ancho. 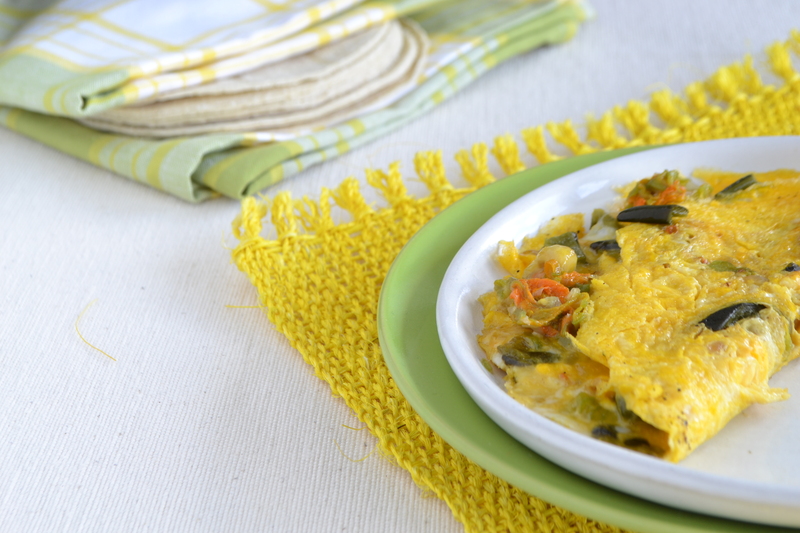 For breakfast I like to mix poblano with chopped fresh zucchini flowers and use the mixture as omelet filling. 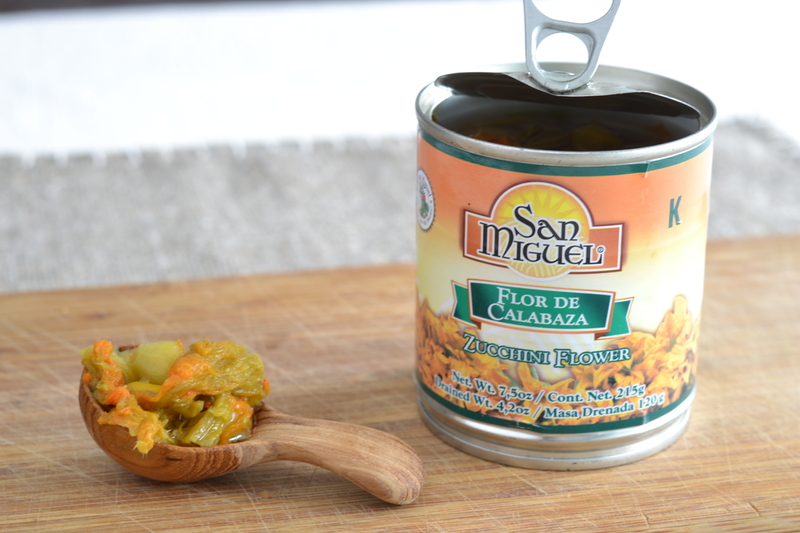 If you have a problem to find the fresh zucchini flowers or if they are out of season you can use canned ones, widely available in Mexican stores or on the internet. To remove the skin place the chile in an electic grill, on a charcoal grill, or broil in the oven until skin is blistered and lightly charred. If you broil it, place baking sheet with pepper on top rack of the oven (2 cm/ 4 inches from the broiler). You can also bake them on 200C / 400F for about 14 minutes. After grilling place them inside a plastic bag for about 10 minute. This will make the process of removing skin easier. Gently remove the skin, stem and seeds. Cut them into bite size strips. 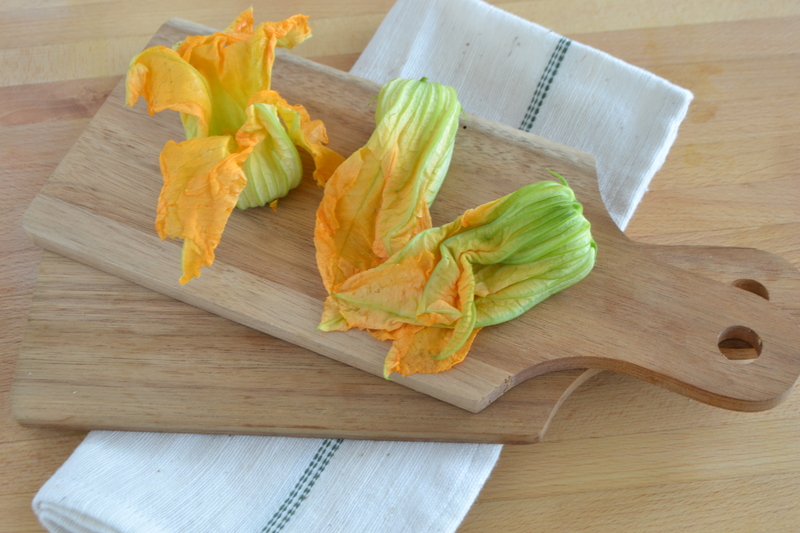 If using fresh zucchini flowers, quickly wash and dry them. If using canned flowers, first drain the liquid. Heat one tablespoon of oil in a pan. Add the chopped onion, lower the heat and continue cooking until onion becomes very soft. Remove pan from heat and add chopped peppers and chopped zucchini flowers. In a small bowl mix 3 eggs, add one tablespoon of water and season to taste. Melt the butter in a flying pan on medium heat. When the butter begins to foam add the eggs and swirl the skillet to distribute mixture evenly. Lower the heat and with the fork gently move the eggs from the sides of the pan towards the center so that raw egg can cook underneath. Add some of the chopped peppers, zucchini flours and onion mixture in the center, then with the help of the fork fold the sides of the omelet. Transfer to plate and serve with warm tortilla. 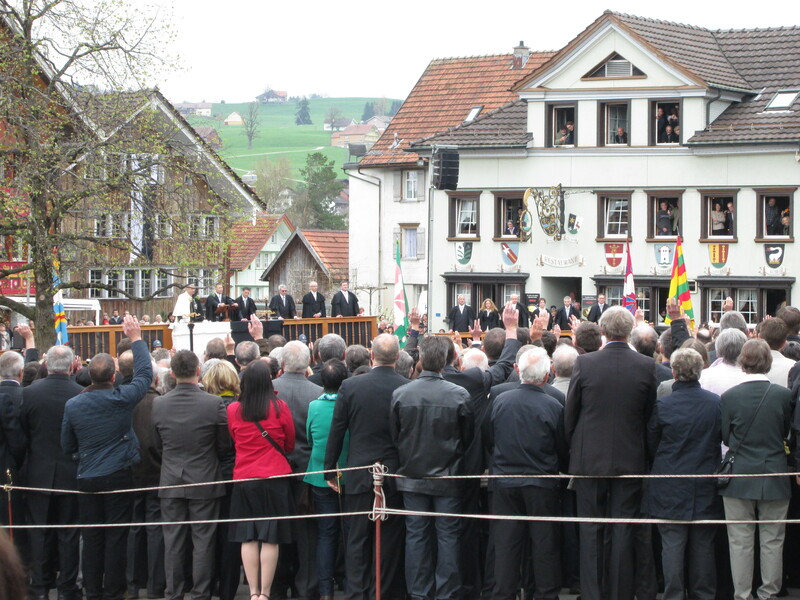 Every year on the last Sunday in April the canton of Appenzell has a very interesting event, voting-by-hand, locally called Landsgemeinde (open-air-assembly). 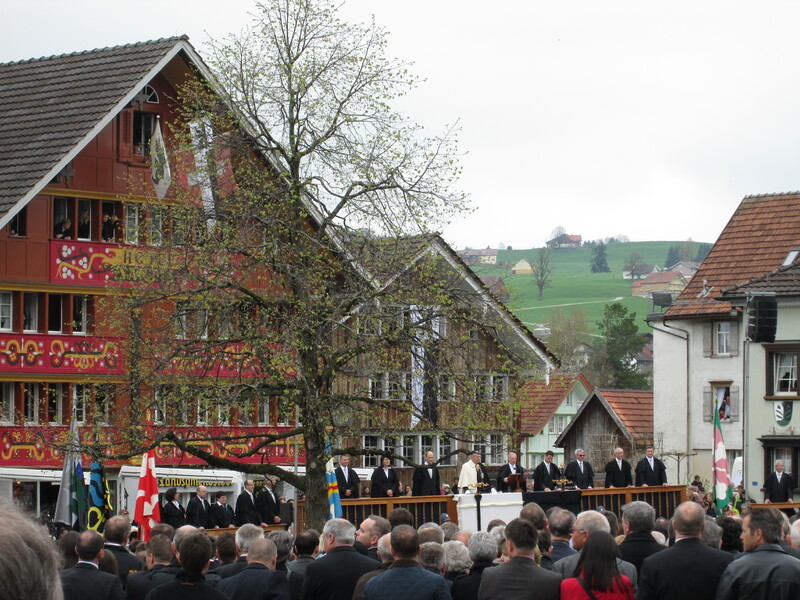 Appenzell as well as Glarus are one of two places in Switzerland that still practice this old tradition. 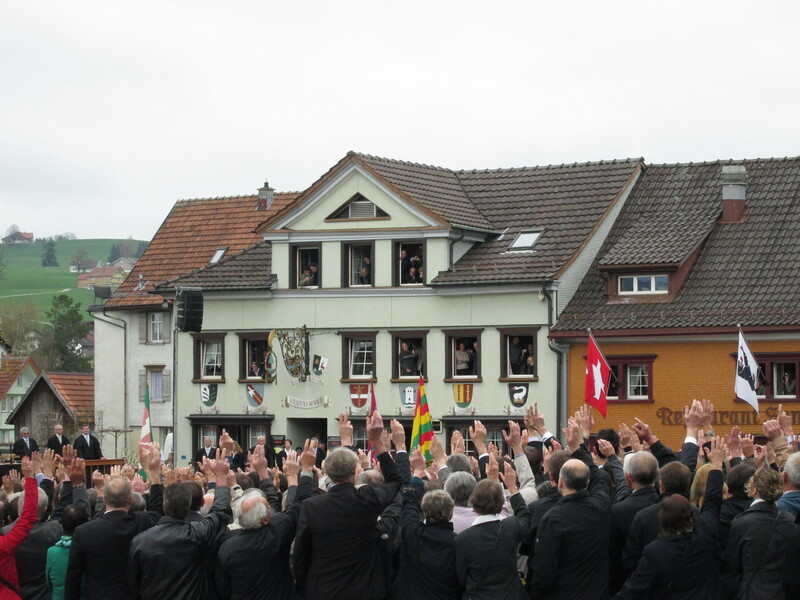 Hand voting was typical for rural areas and can be traced back to the Middle Ages. 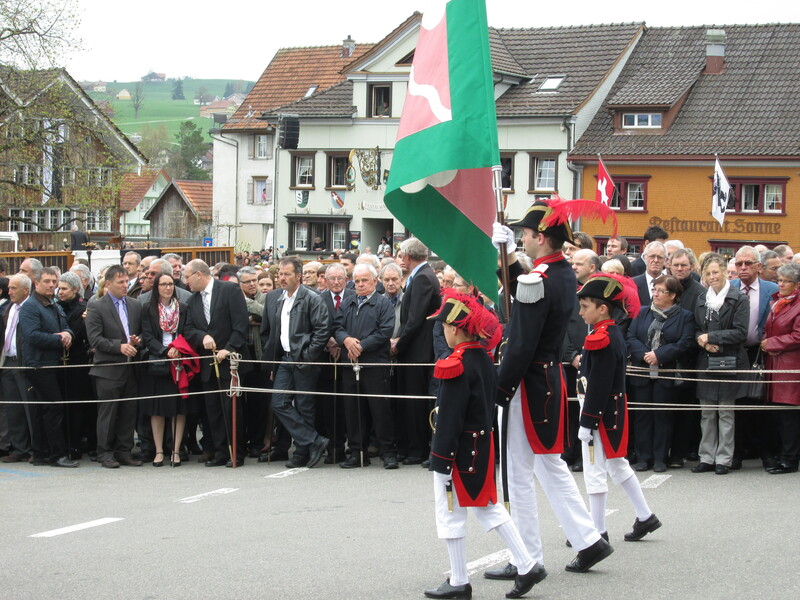 About 3000 eligible voters gather in the town square to decide on laws. I didn’t know what to expect, it was incredible to see just how proud they seem to be able to participate. 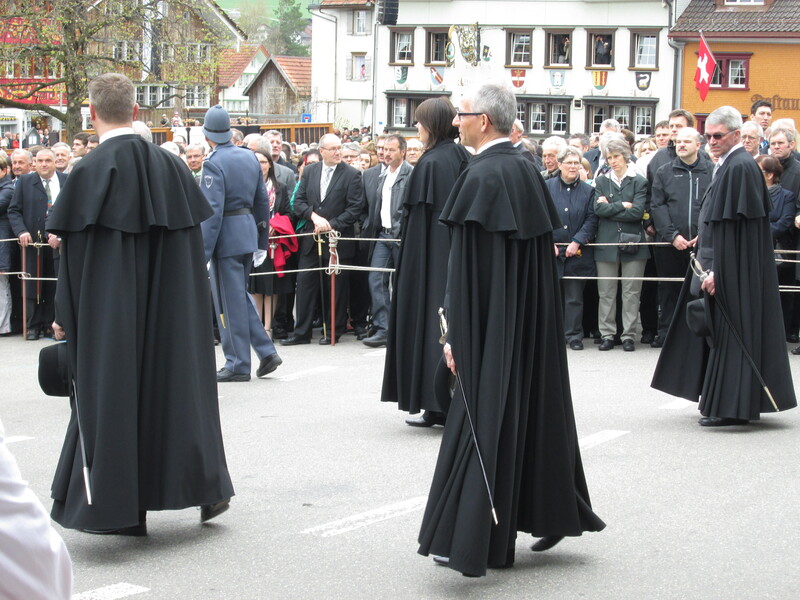 They are all dressed for the occasion, with many men carrying swords, which are handed within families from generation to generation. There are also food stands to satisfy hungry voters, selling cookies named chrempfli ( made from sugar, eggs and flour dough with hazelnut filling inside). These cookies are imprinted in beautiful hand carved wooden cookie molds. 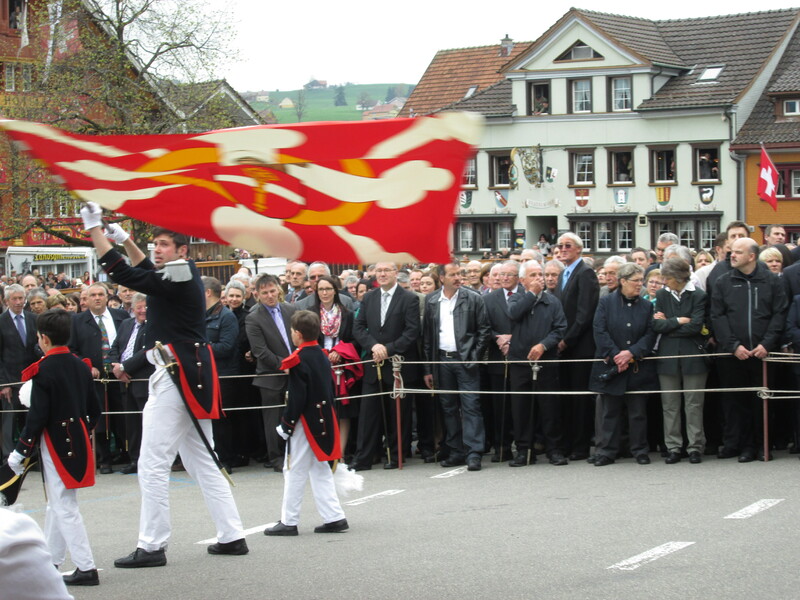 For meat lovers there are boiled Appenzell sausages, predominantly made of beef (siedwurst). You can choose one of these side dishes: cheese noodles and potato (chasmaggerone) or potato salad. 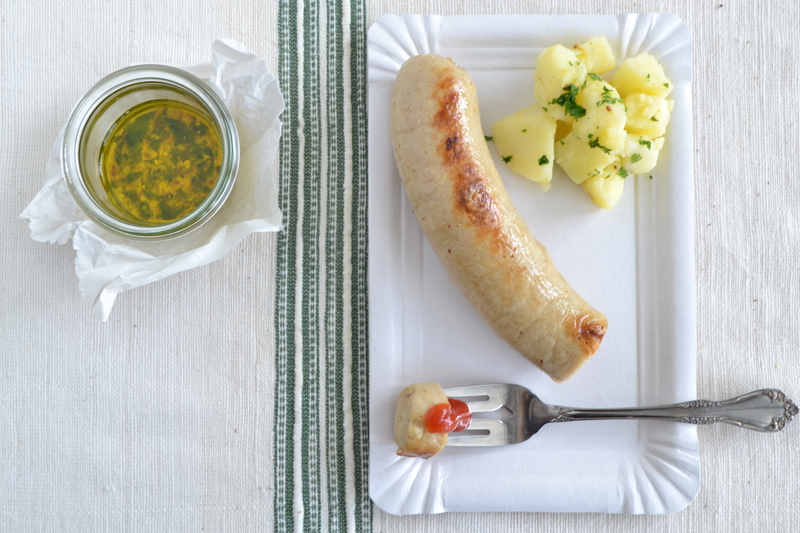 For my weekend lunch I prepared veal sausage with potato and vinaigrette. Gentle boiling will also ensure the sausage is cooked all the way through.After boiling the sausage, place it shortly on a grill to get an even nicer flavor and color. Put potatoes in a pot and cover them with cold water. Add 1/2 teaspoon of salt. Bring to a boil then reduce the heat and cook until potatoes are soft. Drain potatoes, put them in large bowl and cool slightly. Make dressing by mixing oil, vinegar, mustard and parsley in a small bowl. Gently toss potatoes with dressing. Cover with cling film and cool in refrigerator. You can make extra dressing to serve on a side. Fill big pot halfway with water. When water starts to boil add sausages. Lower the heat and simmer for about 10 minutes, until tender. Brush sausages with oil then grill until browned on both sides. Serve sausage with cold potato salad sa well as some dressing on the side. I didn’t cook with “young garlic” often before moving to Switzerland, the main reason is that it was not easy to find. 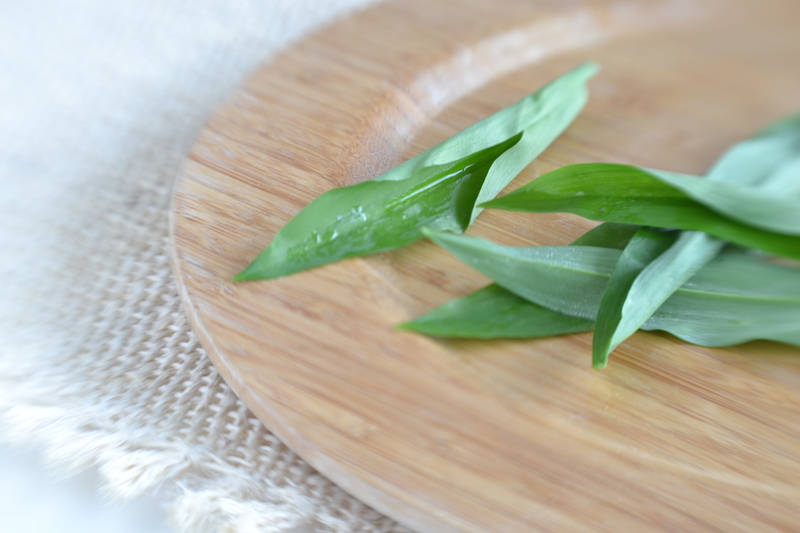 It has a slightly milder taste than regular garlic, and you only eat its leaves, either raw or cooked (in soups, salads, pesto or to spice dishes). Young garlic is available only in the spring, and it grows in woodlands, and in moist , shaded areas. When you walk in wooded areas here in Switzerland you get overwhelmed by the garlic scent filling the-air. 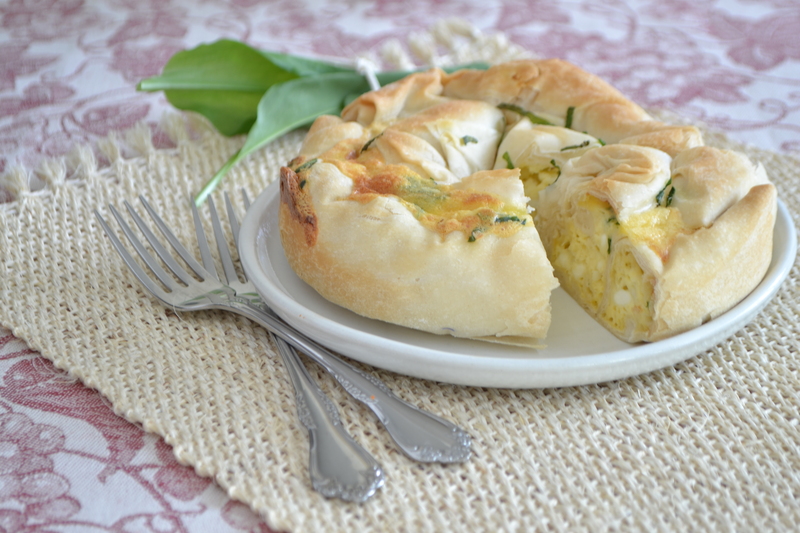 In one of the recipes added it to a cheese pastry called Burek. Burek is made of filo, a paper-thin pastry commonly used in Turkey, but also popular in the Balkans and in Northern Africa. Filo is available in stores in the refrigerated pastry section. If you have access to Turkish stores you can buy it under name Yufka. For the main course I prepared Chicken Cacciatore, and for dessert Physalis-fruit dipped in chocolate. 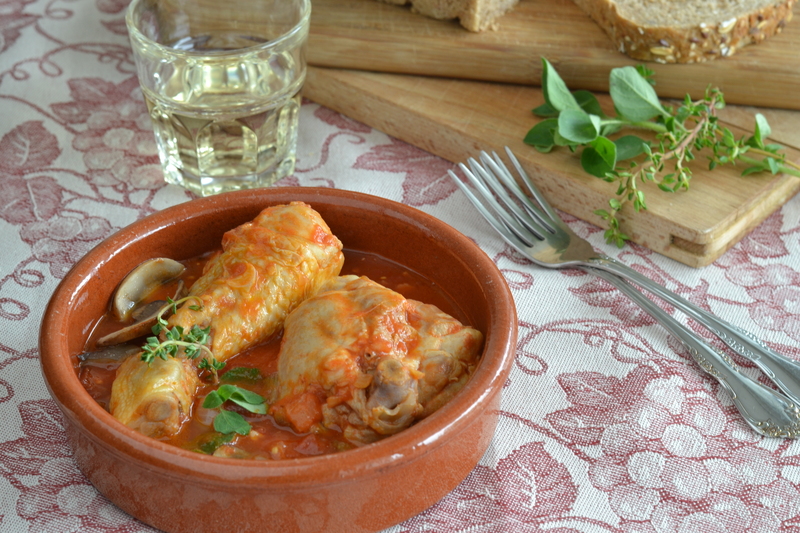 Chicken Cacciatore is a light Italian chicken dish with tomato sauce: (you can also add to it mushrooms or peppers and serve it with either rice or paste. 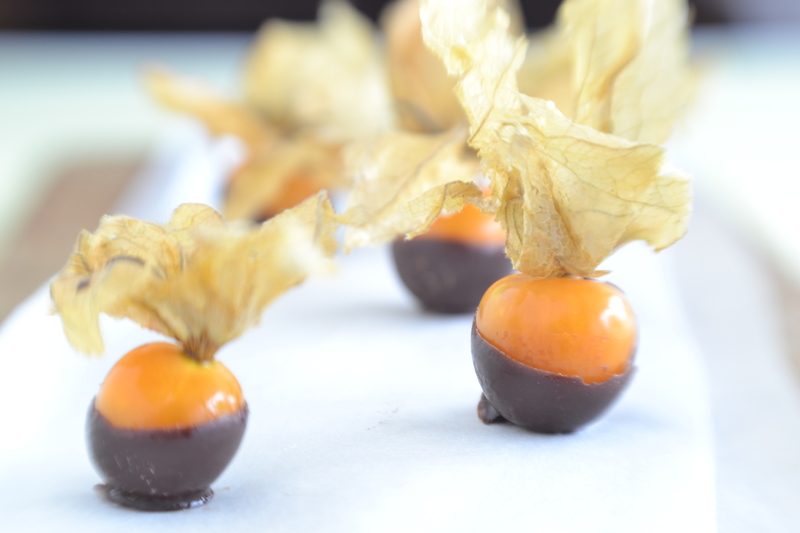 Physalis is a small orange fruit with a slightly acidic taste, it is delicious when paired with chocolate: it helps bring a light-end to the meal. If Physalis is not available you can use other fruits such as: strawberries, banana or pineapple. 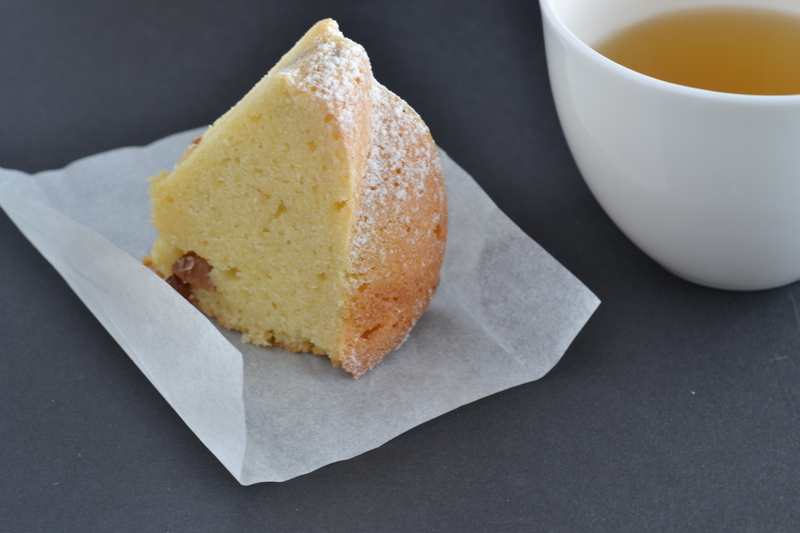 Lightly oil, and then line cake tin (about 15cm – 5.1/2 in wide ) with baking paper. In a small bowl mix feta cheese, creme fresh, egg, baking soda, and half of the young garlic. Remove 6 filo sheets, filo dries quickly so you have to cover them with a kitchen towel. Moisten other kitchen towel and put over first one. Place one sheet of filo on work surface, then brush with oil. Place other sheet on top and brush with oil again. Spoon about 5 tablespoons of filling toward one end, leaving sides clear. Fold sides in, then fold end of pastry over filling. Roll sheets into tube and tuck sides underneath. Place into cake tin seam – side down. Repeat with other four sheets. You will have three tubes filing the cake tin. Brush with the oil and sprinkle with the rest of chopped young garlic. Place in the middle shelf and bake for about 30-35 minute, or until golden brown. Let it stand in a tin for about 5 minute, then take out of the tin and let it cool. Heat one and a half tablespoon of oil in a small pan. Add chopped onion and carrot and saute on a low heat for 15-20 minute, or until soft, but not browned. Add the minced garlic and cook for 30 seconds. Add the mushroom and cook for extra five minutes. Until the onion is cooked, brown the meat. In a large casserole dish heat one tablespoon of oil. Dust each piece of chicken with salt and pepper and brown (skin side only) on medium-high heat. Browning helps to enhance the flavor of meat. Don’t overcrowd pieces. Brown in batches. Tip-of all the fat, and then return all chicken peace’s to casserole. Pour over onion-mushroom mixture. Add wine, chicken stock then thyme, oregano and salt. Add chopped tomatoes with their juice. Cover casserole with the lid, bring to the boil, then reduce heat to low simmer and cook about 45 minutes, or until chicken is completely cooked ( when testing a piece of chicken the juices should run clear). Discard the thyme and oregano springs. Lift out chicken pieces and keep warm. Bring the sauce to boil and cook until reduced, and gets thicker. Adjust seasoning if necessary. Arrange chicken peaces on a plate and spoon sauce over. You can serve with rice or pasta, or a slice of crunchy bread. Lift dry leafs and wash the fruit. Let them dry. Place the chocolate in a heatproof bowl over a saucepan of simmering water. Make sure the bowl doesn’t touch the water. Stir occasionally until chocolate melts completely. Remove from heat. Dip each fruit into the chocolate, let the excess drip. Place them on baking paper, and let them sit at room temperature. 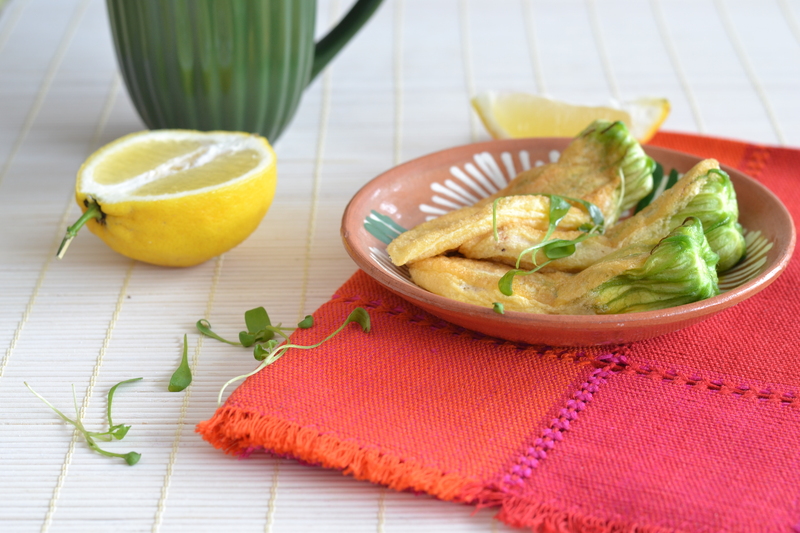 Zucchini flowers appeared in stores last mounth. I wish that certain foods were available all year round, and they are one of them. Unfortunately, they are only available for a short period of time, so I try to eat them often and prepare them different ways. 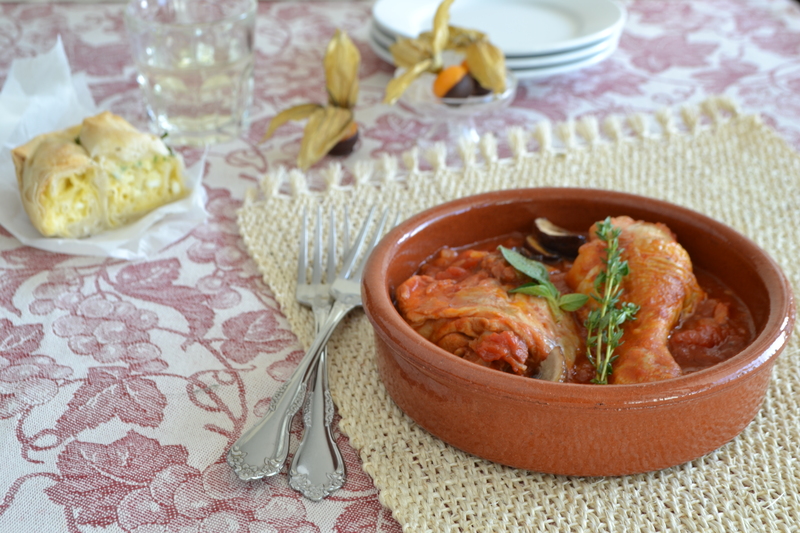 For this menu I stuffed zucchini flowers with ricotta cheese and little bit of toasted pine nuts. You can also dip them in flour and egg and deep-fry, or chop them, saute with onions and use in quesadillas. I think they are a great appetizer or snack. The flowers are very delicate so you have to work carefully. Most of the time they come squeezed in a plastic package so you need a little patience when handling them. For the main course I made salmon en-papilotte (baked in parchment paper) with layers of vegetables, and for a dessert, a light and easy to make yogurt panna cotta. I placed the panna cotta into a half-sphere metal moulds, but you can use any moulds you want. In a small skillet lightly toast pie nuts. Mix ricotta until soft. Add toasted pine nuts and salt to taste. Squeeze little bit of lemon juice. Fill the piping bag with a mixture. Remove the green leafy bits from the base of the flower (sepals). Rinse quickly and shake the excess water. Carefully separate the leafs and using piping bag fill each flower with about a tablespoon of ricotta mixture. Close leafs and lightly twist so that ricotta doesn’t come out when frying. Heat two tablespoons of oil. Gradually add yolks to egg whites beating all the time. 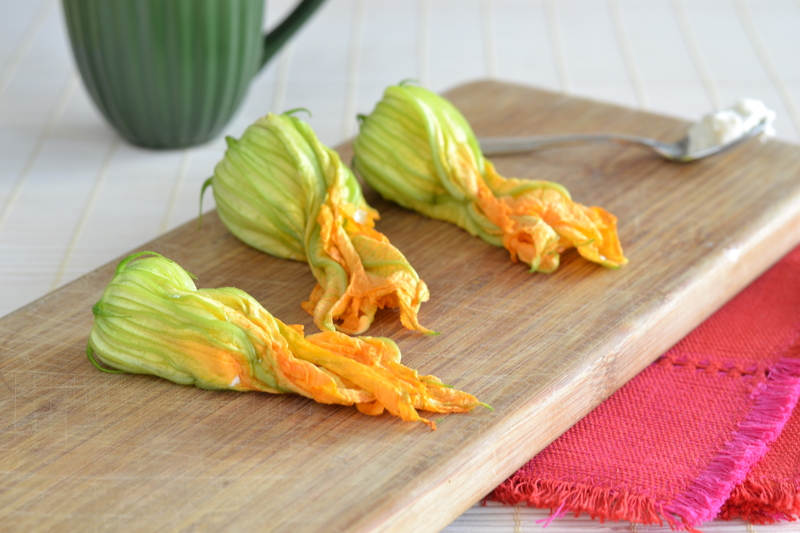 Dust each stuffed zucchini flower with the flour, then dip in beaten egg mixture. Carefully lower each flower into the hot oil. Reduce the heat and fry about one minute per side or until golden. 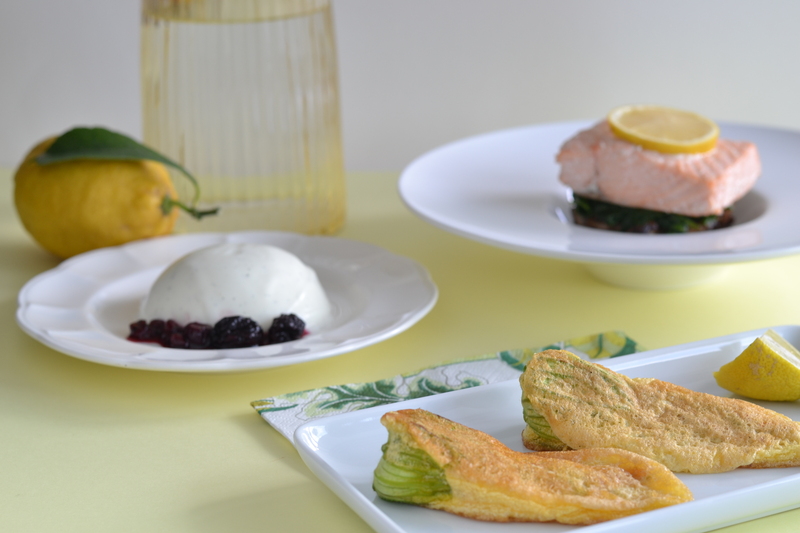 Divide courgette flowers between plates and serve immediately with a slice of lemon. Pre-heat the oven to 180C /350F. Put the potato slices in a bowl. Cover them in oil and season. Mix well. Spread potato on lightly oiled roasting tin, then put in the oven and roast until golden, about 25 minutes. Adjust the oven to 220C /425F. 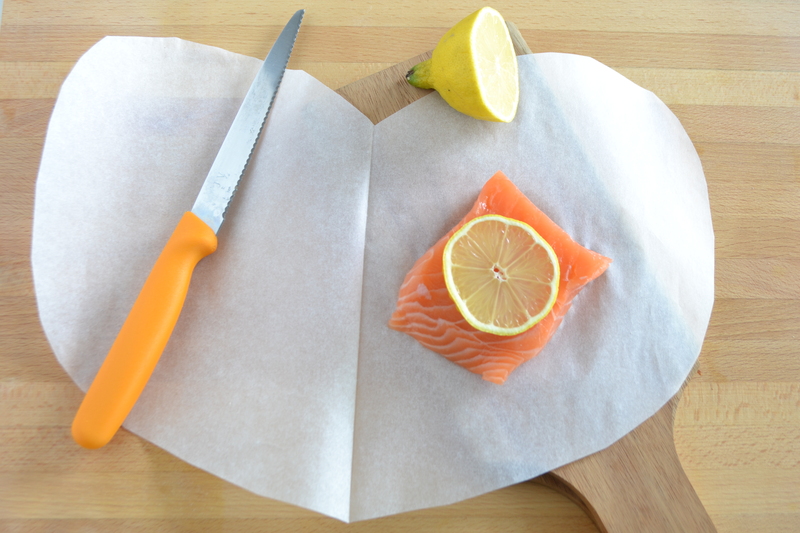 Cut out 4 heart shapes from greaseproof paper, big enough to enclose the fish plus a border. Place the fish on one side of each paper heart, lightly oil and season. Place on top slices of lemon. Fold the other half of the paper over the top, and pleat the edges tightly to seal, twisting the end. Put on the baking sheet and place in the oven on medium shelf for 10 minutes. In a mean time prepare the spinach and mushrooms. In a small pot heat one and a half tablespoon of oil. Add the mushrooms, reduce a heat and cook for about 5-10 minutes, until soft. In a big skillet heat little bit of batter then saute the spinach. Squeeze before serving. Place a pastry cutter (or a mould) about 71/2 cm wide and 3cm height. Firs place the layer of potatoes in the cutter, then layer of mushrooms. 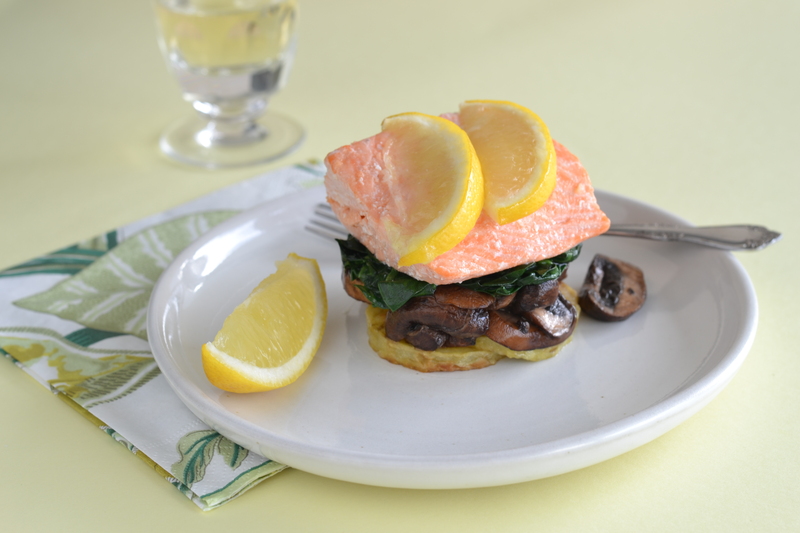 Add some of the spinach and finish with piece of salmon. Cut the vanilla bean lengthwise and with a knife scrape the seeds. Place the cream, vanilla bean and sugar in a small saucepan and bring to scalding point (when cream starts to steam and when small bubbles appear around the edges of the pan over low heat). Remove the pot from the heat and set aside for 10 minutes for flavors to infuse. Soak the gelatin leaves in cold water for five minutes, until they have softened. Sieve the cream mixture then add the softened gelatin and mix until completely dissolved. Pour in the yogurt and mix well. Divide the mixture into the metal half-sphere moulds. Put into the refrigerator overnight. To prepare the sauce put the berries, sugar and wine in a small pan. Simmer gently, stirring carefully until the sugar dissolves and fruit softens, for about 10-15 minutes. 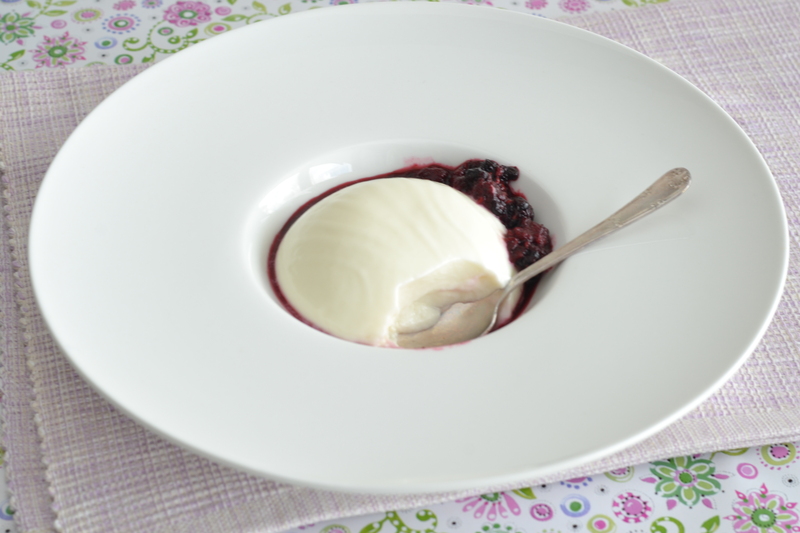 To unmould the panna cotta dip the mould in hot water. Put them gently onto individual plates, and serve with the sauce. 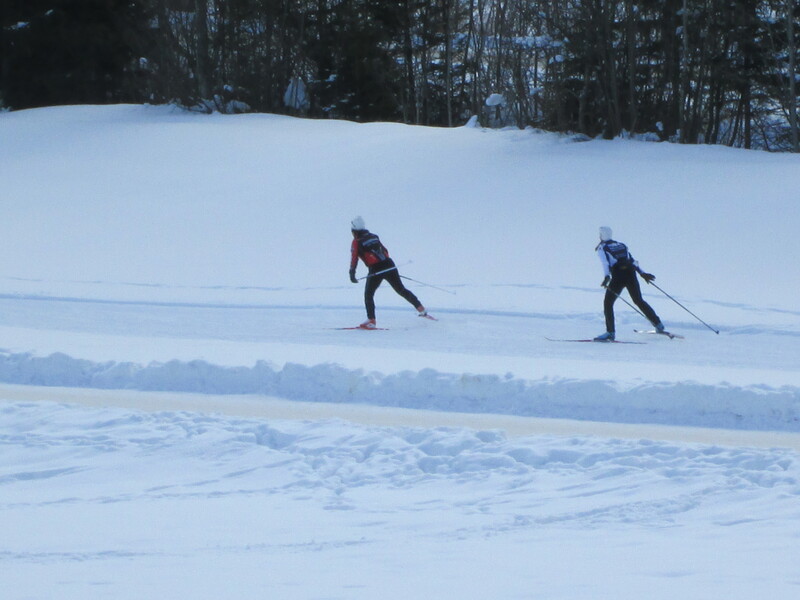 I have discovered my new passion, it’s cross-country skiing or as they call it here langlauf. 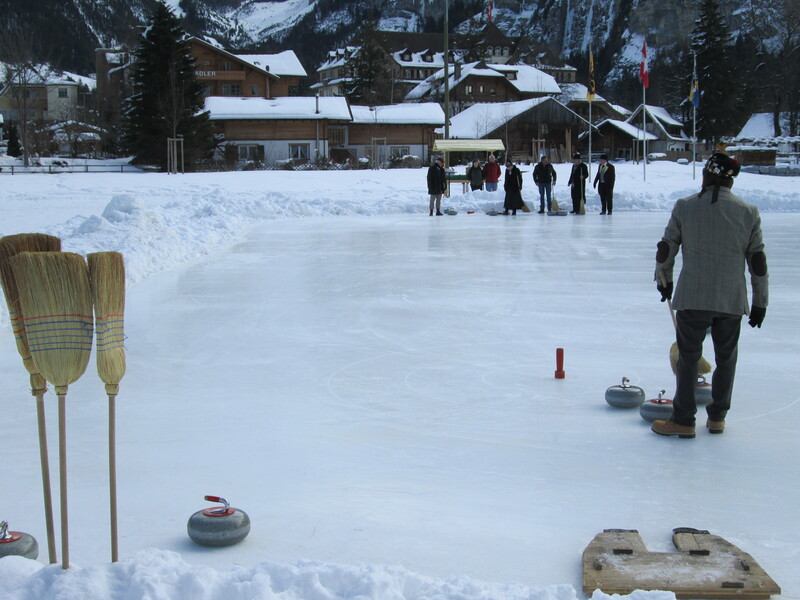 To be honest before coming to Switzerland I hardly knew about this winter sport. It is a great exercise for the whole body. This winter I decided to visit different mountain resorts which have cross-country tracks. 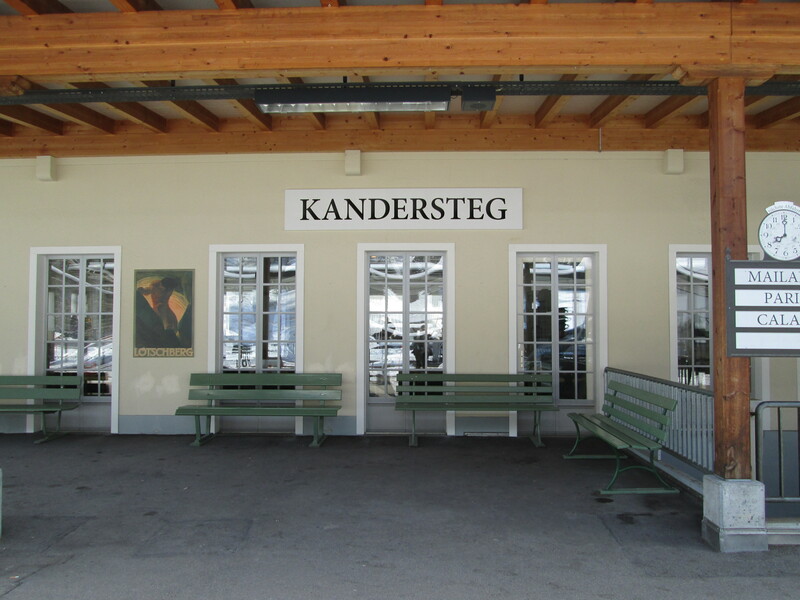 One of them is the small ski resort of Kandersteg. 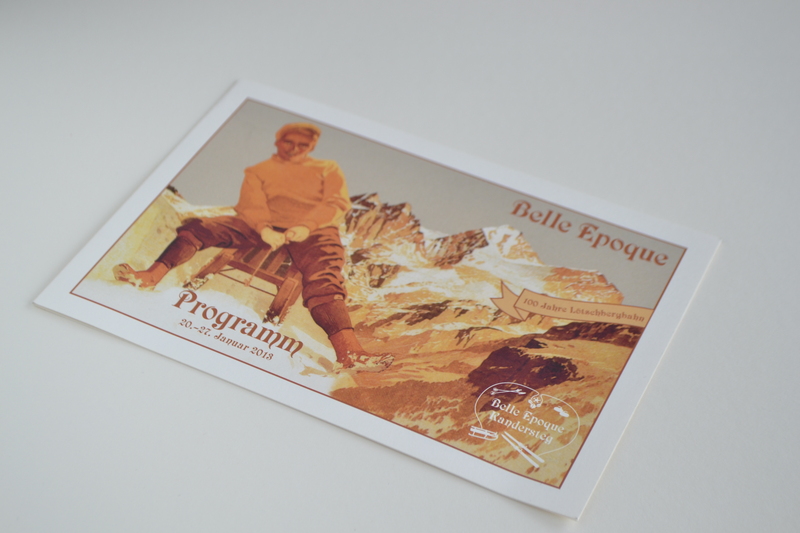 Starting in 2009 the town established Belle Époque week celebrating the 100 years of the beginning of skiing as a recreational activity and sport. 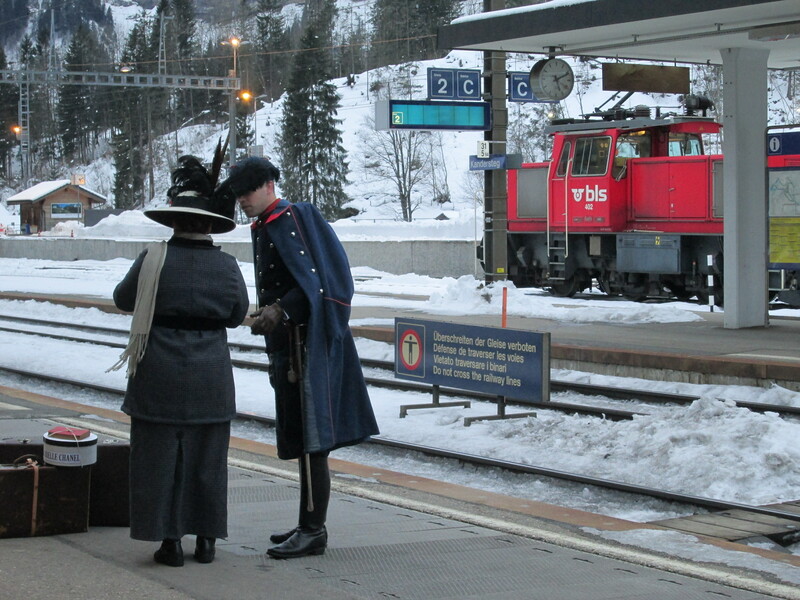 Right after exiting a train there are signs that you are coming in contact with the past. You can hear music from the late 1800’s and early 1900’s coming from a nearby ice-skating ring with skater’s wearing Belle Époque costumes. 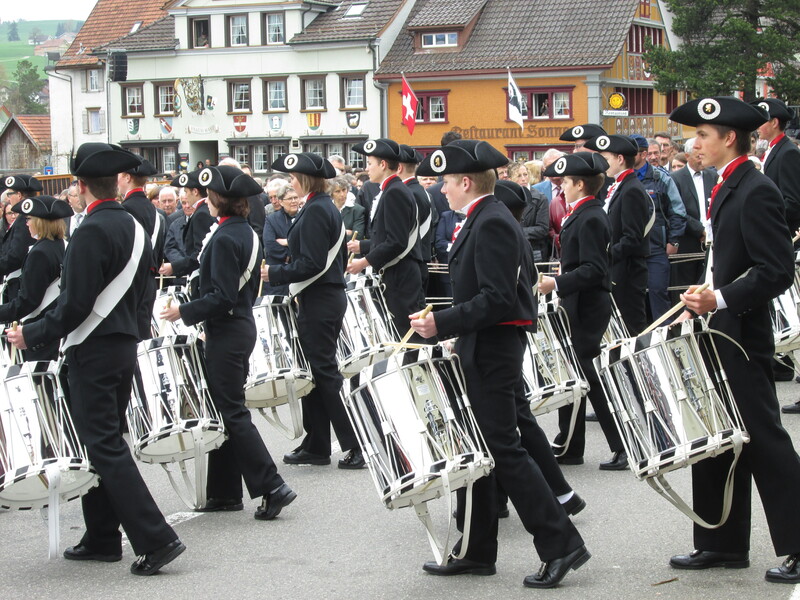 Walking through town you are passing by stores, all decorated for the occasion. It is a bit as stepping in a “time machine”. I can’t belive how seriously people prepared for this event; from hotel decoration to restaurants staff fully dressed in costumes, everyone is living in the past. Their outfits don’t look like cheap Halloween costumes, but are very elaborate and realistic. It is almost like you have entered film set. In some hotels there are balls with traditional music and food from that period. 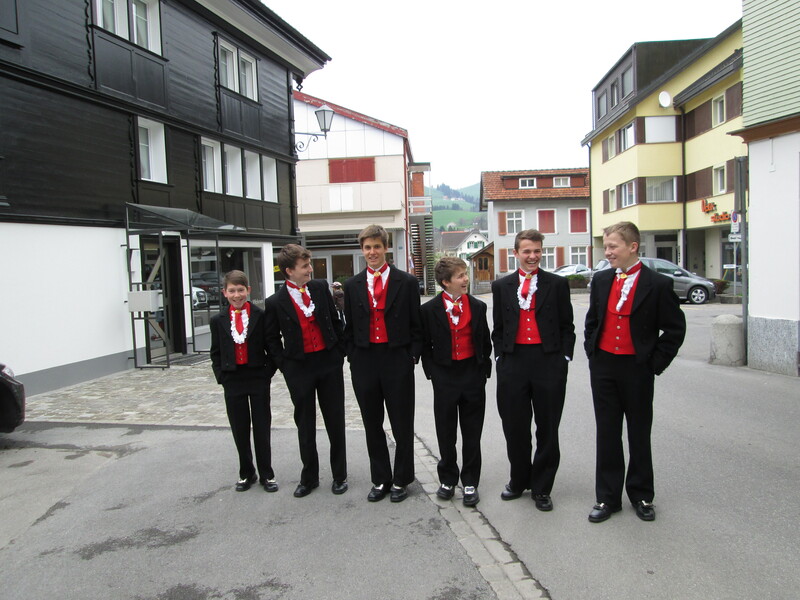 I hope to return to Kandersteg with a beautiful outfit and visit some of the special events. Make the filling. In a small bowl mix ricotta, creme fresh, sugar and few drops of vanilla until smooth. 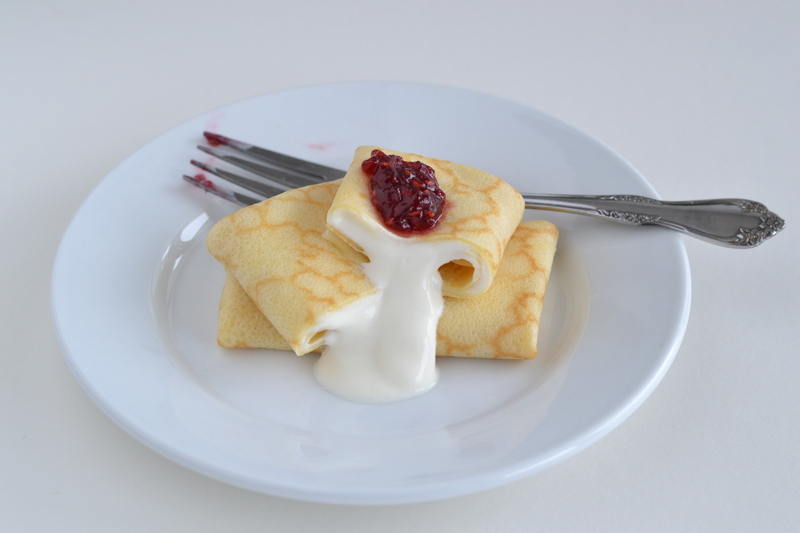 To make the blintzes place eggs, milk, melted butter, flour and salt in blender. Blend for 20 seconds. Scrape down the sides and blend for a few more seconds. Place a small frying pan over medium heat. Brush small amount of oil. Pour 2 tablespoons of the batter, and then swirl the pan to coat the bottom. Cook until just golden. Turn blintzes on other side to fry for a few seconds. 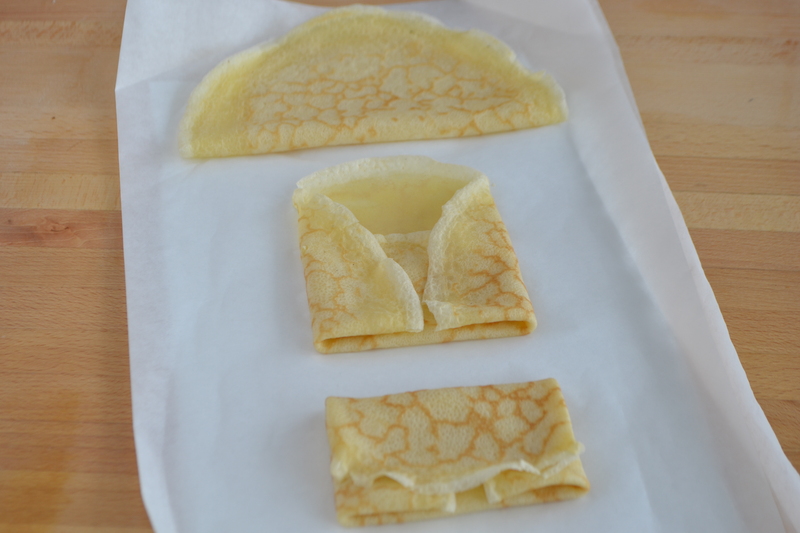 To fill the blintzes, place one tablespoon of filling in the center. Fold. When ready to serve, heat a little bit of butter or oil in a large skillet. Saute the blintzes approximately three minutes on each side, until golden brown. Top each with a teaspoon of strawberry jam. This menu is for late morning entertaining (like busy mothers meting friends in between school runs), but you can use the same menu for an afternoon coffee or tea. It looks pretty, it is easy to make and it is light. 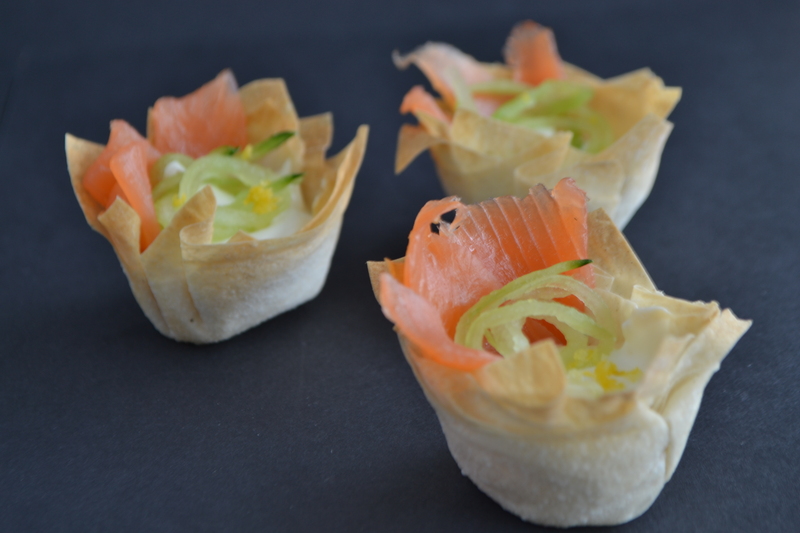 It combines a teacake with small salmon filo cups and chicken sandwiches. 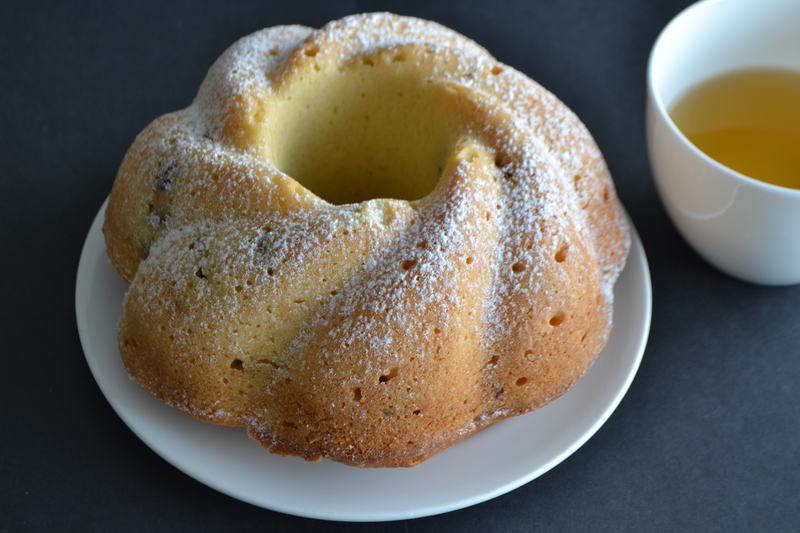 The cake is moist, not too sweet and can be made the night before. You can be creative with the cake’s design. I was eager to use a new ceramic mold I bought the last week in the flea market. It seems I can find endless cake mold designs here in Switzerland. In one occasion I used small tins as molds and served them individually. 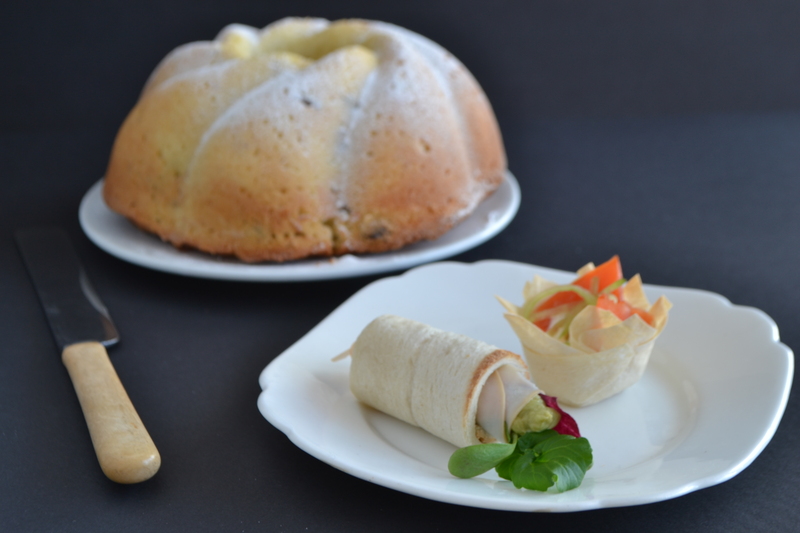 The little sandwiches are made of white sandwich bread which is first flattened with a rolling-pin and then rolled around 2cm thick cylinder molds (like the ones used to make cannoli). The internet is also a great supplier of creative kitchen utensils. Little cups are made of my favorite kitchen pastry, filo. Filo is a paper-thin pastry and because it has a tendency to dry you have to work quickly. These cups are light and crisp. Soak the raisins in the Rum preferably overnight. Preheat the oven to 180C / 350F. Place the shelf in the middle of the oven. Prepare cake tin (about 6 1/2 inch tube pan). Cover inside with a thin layer of butter then dust with thin layer of flour. Sift the flour, salt, baking powder, and set aside. In a bowl or standard mixer mix the butter and sugar until pale and creamy. Add the eggs, beating well after each addition. Add raisins with its soaking liquid. Fold in some of dry ingredients, alternating with cream. Make sure you add dry ingredients last. Pour dough into prepared tin: it will fill 3/4 of tin. Bake for about an hour, or until golden brown in color. Let it cool for 10min, and then turn to wire rack, take out of the mold to cool completely. Sprinkle with the powder sugar. Preheat the oven to 180C/350F. Place the shelf in the middle of the oven. Cut the avocado in half and take the pit out. Scoop out the flesh and blend with a bit of creme fresh. Add a little bit of lemon juice and salt until desired consistency and taste. 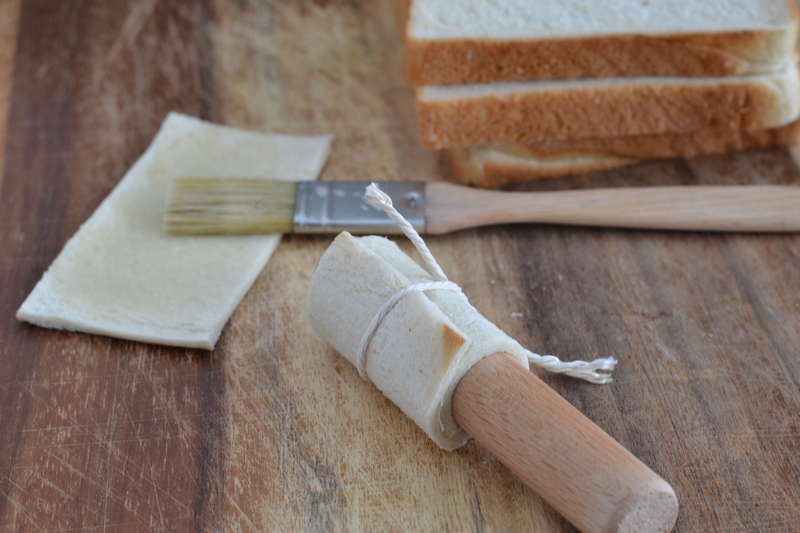 Flatten each slice of bread with a rolling-pin, and then slice each slice in half. With a pastry brush, brush one side of bread with thin layer of melted butter. Wrap buttered side around a mold and tie with a piece of kitchen string. Put the prepared moulds on the baking sheet and bake for about 5 minutes to toast lightly. Take them out. Carefully slide the sandwich rolls out of the mold. Cool and carefully take the strings out. Take the prepared avocado cream out of the refrigerator. Fill the piping bag with the cream. 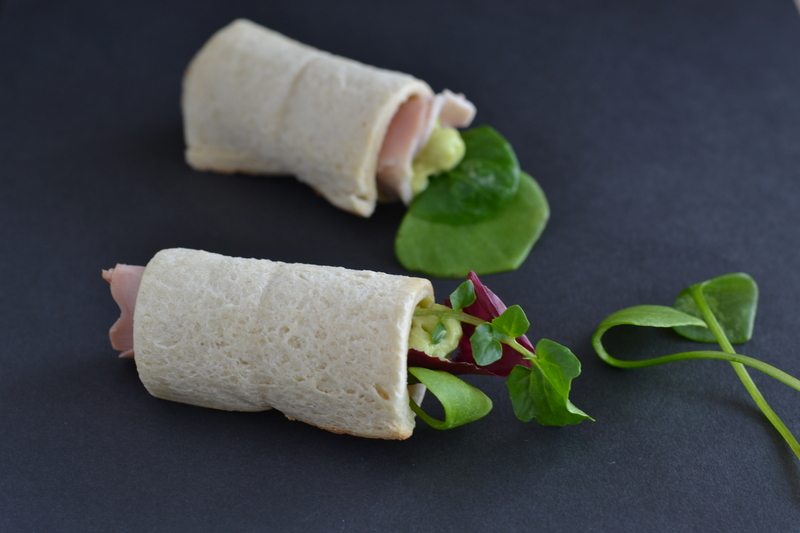 Roll pieces of salad with small pieces of meat and stuff them into toasted bread tubes. Pipe in a little bit of avocado cream. Use a little bit of melted butter to grease mini muffin pan. 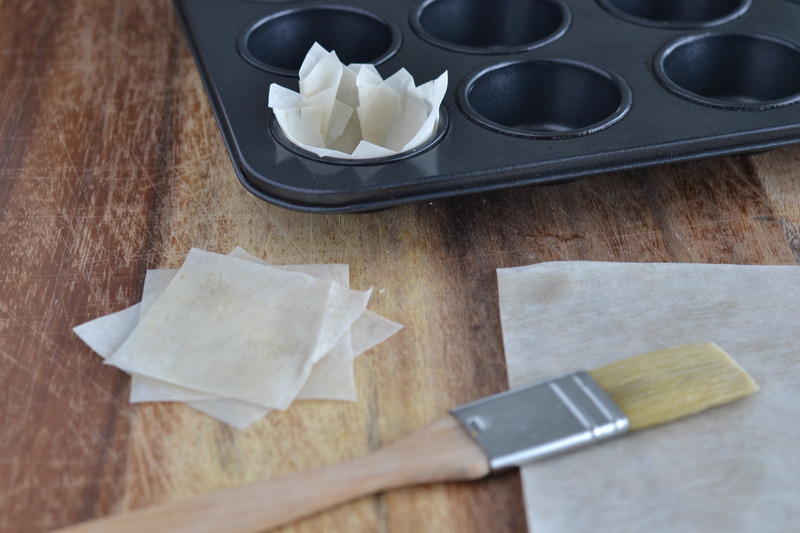 Lay one sheet of pastry onto your work surface. Cover the rest with a kitchen towel to prevent drying. 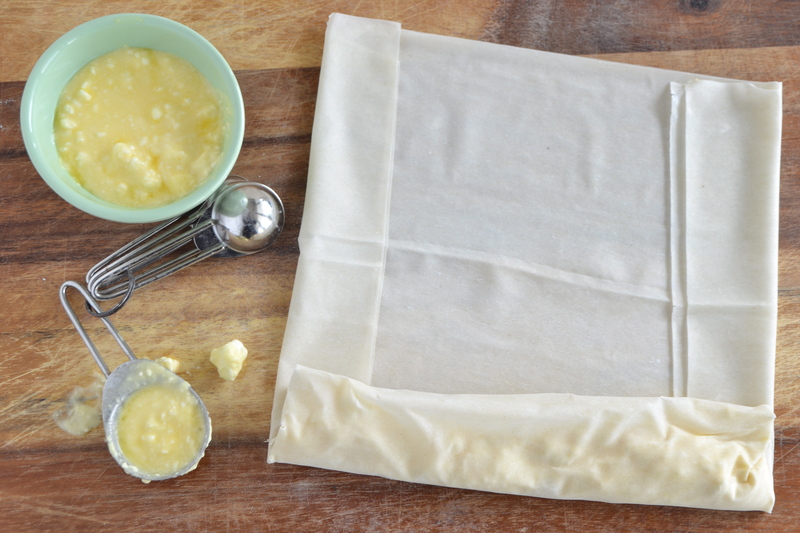 Brush the filo sheet with thin layer of butter. Cut large enough squares to line the muffin tin holes with, and have some overhanging. Repeat the process with another sheet. Line the holes with 3 filo pastry squares, pushing them down and on the sides. Bake for about 10 minutes, until golden brown. Let them cool in the tray. Carefully take them out of tray. Cut the smoked salmon onto strips. Make the filling. In a small bowl mix the creme fresh and lemon zest. Peel the cucumber, then using a canella knife (also known as citrus zester) make thin strings. Fill each cup with teaspoon of cream and pieces of smocked salmon. Decorate with strings of cucumber and a little bit of lemon zest. 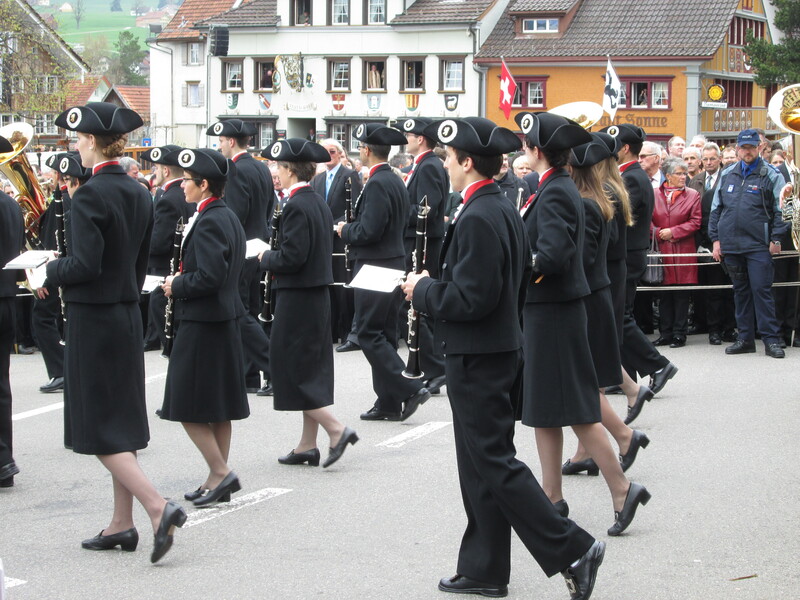 This is the time of year when many stores in Switzerland are full of little seasonal cookies. Cinnamon, almonds, hazelnut, anise and cloves are the most common ingredients. I like the fact that the cookies are very small, so you don’t feel that much gilt having one with a cup of coffee or tea. The problem is that my favorite cookies are so tasty that I end up eating at least three or more each time. This winter I decided to bake my own christmas cookies, and the home made ones are delicious even better than the ones you buy. I made two types of cookies that are made without flour so they are also gluten-free, Brunsli (chocolate and almonds), and Zimsterne (cinnamon and almonds). The recipes are very simple, but rolling the dough requires a little bit of patience. If you use some tricks on how to keep the dough pliable the cookies are really fun to make. The refrigerator is a great help. Don’t get frustrated if at first they are mishaped, they are very tasty and ” a rustic look” is just fine! Ground chocolate with sugar in a food processor. In a big bowl combine ground almonds, ground chocolate, sugar, pinch of salt, cocoa powder, cinnamon and cloves. Add egg whites and Kirsch and with a wooden spoon mix well. With hand incorporate dough into ball. Transfer dough on working surface sprinkled with a little bit of cocoa powder. If dough is to sticky, add a little more of cocoa powder, if is too dry add a bit of extra egg whites. Divide it in two halves. Make flat disk and wrap into cling film. Put into refrigerator for a minimum of 30 minutes to harden. That makes it less sticky. Put dough in between two sheets of cling film, and then roll until 1 cm ( 1/2 in) thick. Use cutter to shape your cookies. Put cookies on a tin, lined with a baking paper. Let them sit overnight to dry. 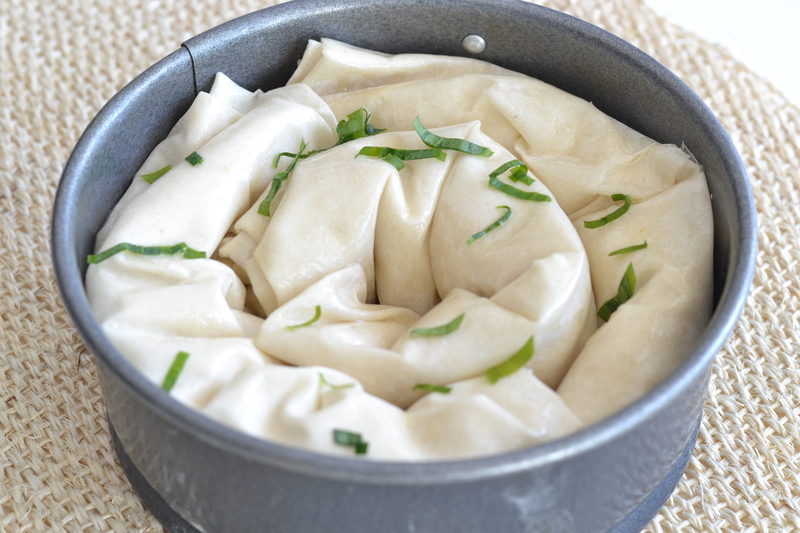 Leftover dough roll into ball, make a flat disk, put into refrigerator and repeat the process. Preheat the oven to 150C /300F. Bake about 10-12min. In a big bowl combine ground almonds and cinnamon. Mix egg whites and icing sugar until stiff peack. Put one third of mixture to almond mixture and mix with awooden spoon. 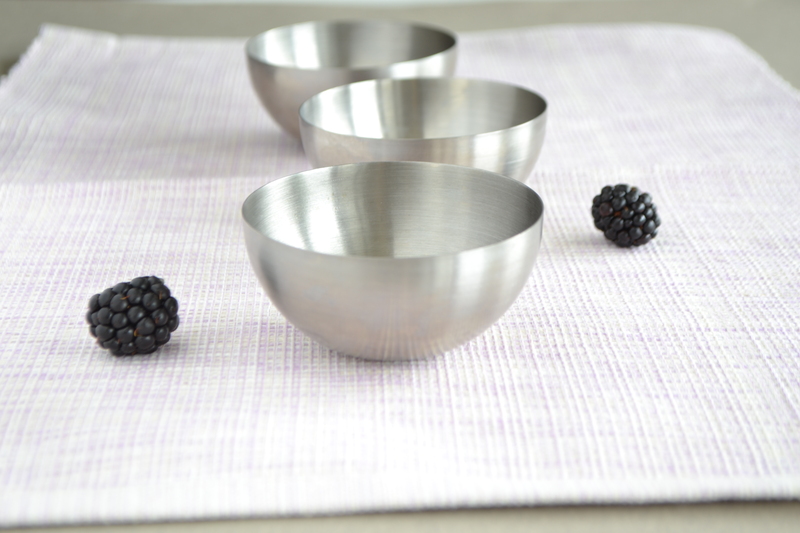 Hand shape it into a ball and transfer to a working surface lightly sprinkled with a sugar. If too sticky add more almonds or if too dry add a little more egg whites. Make a flat disk and wrap into a cling film. Put into refrigerator for a minimum 30 minutes to harden. Put dough in between two sheets of cling film and roll until 1 cm (1/2in) thick. Use star cookie cutter to shape your cookies. Dip each cookie into the egg white mixture you set aside. When mixture gets thick dilute with little bit of water. This is technique that works the beast for me. You can also apply with a brush. It requires a bit of patience but as you repeat the process it becomes easier. Put them on a cookie sheet lined with baking paper and let them dry overnight. Preheat the oven to 150C /300F. Bake cookies for 10-12 min., don’t let the icing become brown.